he woman in the UF Health Jacksonville emergency room presented a puzzle for attending physician Faheem Guirgis, M.D. In her early pregnancy, she had a sore throat and a fever. Those symptoms were not alarming compared with those of other patients being seen on that busy day, but Guirgis had a feeling that something wasn’t quite right with her. He ran routine lab tests, which came back “a little off,” he said. Guirgis handed her care over to the next shift, but overnight the woman’s condition deteriorated, and she went into shock. The expectant mother, it turned out, was septic. The nation’s third-leading killer, sepsis is a complication in which the body has a severe, overwhelming response to an infection. Guirgis said that if he had access to a test for a sepsis biomarker, he could have diagnosed the sepsis before her symptoms emerged. 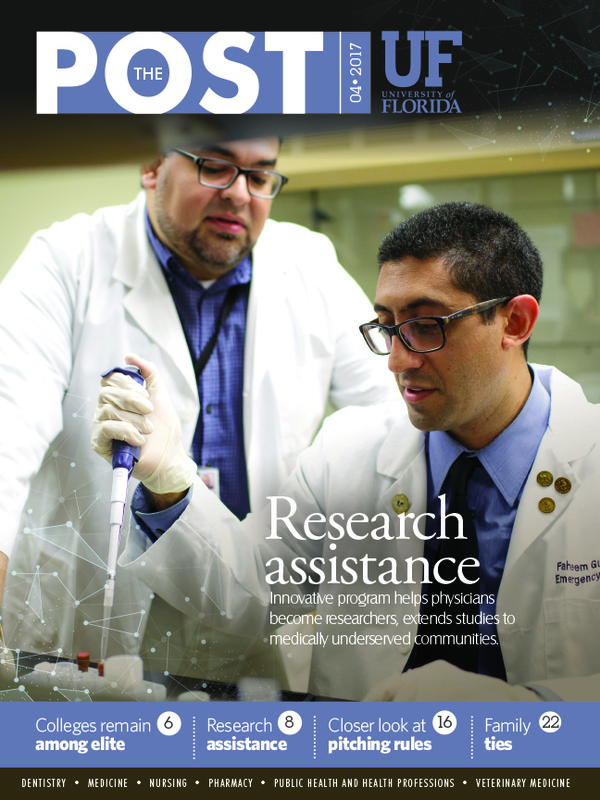 But clinicians at satellite campuses, even if they are at large urban hospitals like UF Health Jacksonville that are affiliated with a nationally ranked academic institution, can face barriers to doing research. Physicians like Guirgis often face a choice: Leave their public hospitals and the patient populations they are devoted to serving and move to an institution with a more robust research infrastructure, or stay and try to find some way to advance their research goals. Guirgis’ interest in research led him to Thomas A. Pearson, M.D., M.P.H., Ph.D., UF Health executive vice president for research and education. Pearson recognized the intellectual hunger in Guirgis. Guirgis also began working with his main mentor, Frederick Moore, M.D., FACS, a professor of surgery at the UF College of Medicine and the principal investigator of the UF Sepsis and Critical Illness Research Center. The first of its kind in the nation, the center was created with a $12 million, five-year grant from the NIH National Institute of General Medical Sciences in 2014. The center serves as a tool to promote collaboration and enables young faculty to garner additional NIH funding, Moore said. Guirgis’ co-primary mentor is Christiaan Leeuwenburgh, Ph.D., director of the UF Division of Biology of Aging, who also serves on the directorate of the CTSI Translational Workforce Development Program. Other mentors included Lyle Moldawer, Ph.D., a professor and vice chair of research in the UF College of Medicine’s department of surgery; Sunita Dodani, M.D., Ph.D., and Robert L. Wears, M.D., Ph.D., both based in Jacksonville; Srinivasa Reddy, Ph.D., of the University of Califonia, Los Angeles; and Alan E. Jones, M.D., a professor and emergency department chair at the University of Mississippi Medical Center. The cycle of research and discovery is continuing: Guirgis’ new grant freed up his spot in the KL2 program, providing grant funds for another early career scientist to enter the program. Guirgis’ journey demonstrates a new model for developing paths to research careers, said CTSI Director David R. Nelson, M.D., a professor and associate dean for clinical research at the UF College of Medicine and assistant vice president for research. It’s the kind of team science and research ecosystem the CTSI aims to build, he said. Access to research is doubly important for underserved populations like those in and around Jacksonville, which is poised to become a majority minority city: 55 percent of its youngest residents are members of a minority group. When clinicians working at hospitals like UF Health Jacksonville conduct research, it’s easier for more patients who are members of minority groups to participate because the research is being done where they already go for health care. Funding also helps clinicians like Guirgis overcome a chief obstacle to conducting research: The demands on their time. Participants essentially buy back the time they would normally devote to clinical practice and put that time toward research. Guirgis has helped propel initiatives in Jacksonville, Leeuwenburgh said. And his research is already showing results. Guirgis said his team has demonstrated for the first time that sepsis patients often have high levels of “dysfunctional HDL,” or high-density lipoproteins, in their blood. They want to find out whether dysfunctional HDL , a kind of cholesterol, can predict chronic critical illness, an intensive care unit stay of greater than 14 days with organ dysfunction, or long-term adverse outcomes after sepsis. Chronic critical illness has become a common problem in sepsis patients, and results in decreased quality of life and eventual death. Research into chronic critical illness is being spearheaded by Moore and Moldawer at the Sepsis Center. Guirgis said his interest in research has not taken away from his work with patients. Doing this research “has absolutely informed my clinical practice,” he said.